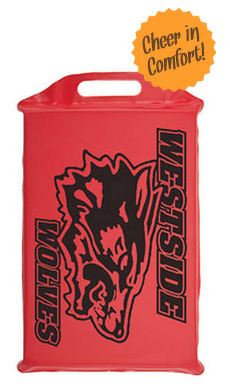 Our 2" thick Premium Seat Cushions are ideal for concerts, sporting events, or other venues. Take the supreme deluxe comfort cushion anywhere you travel with this easy over-the-shoulder 1.5"x 48" poly web, carrying strap. New Optopoly™ foam enclosed in a waterproof 600 denier polyester fabric with PVC backing. Imprint your personalized artwork and text with our free artwork design service! Designed for 2" thick supreme deluxe comfort seat cushions. Purchase yours now!